On Monday, January 8, 2018, a Harfang drone belonging to the 1/33 "Belfort" Drone Squadron landed for the final time on Cognac-Chateaubernard Air Base (BA 709), before its withdrawal from active service. In the presence of of General Éric Charpentier, commander of the Fighter Aircraft Air Brigade (BAAC), and in the presence of civilian authorities, airmen paid a final tribute to the Harfang drone. “Throughout this ceremony, we have been able to express the hallmarks of our Air Force: esprit de corps, teamwork, rigor and precision," General Charpentier said during his speech. Capable of remaining in flight for 24 hours at an altitude of 7000 meters, and to instantly transmit captured images to both command centers and combat forces, the innovative Harfang MALE (Medium Altitude Long Endurance) drone system, bows out after more than ten years of service. It was the then-Experimental Drone Squadron 1/330 "Adour" at Mont-de-Marsan air base that was responsible for defining the concept of employment. The first flight of the Harfang at the Flight Test Center at Istres air base dates back to 9 September 2006 and, in February 2009, Harfang was spreading its wings in Afghan skies for the first time on operations. Since the second half of 2009, Harfangs have been stationed at Cognac. They contribute to the protection of the national territory within the framework of the special air security and internal surveillance missions during major national events such as the G8 and G20 meetings or the European Football Championship. Deployed on foreign operations, Harfang accumulated over 5,000 flight hours in Afghanistan, and also took part in Operations Harmattan, Serval and later Barkhane. In total, more than 7000 flight hours were performed over the African theater before a final return home in July 2016. This system will have flown 15,440 hours of flight without any accident. The 1/33 "Belfort" drone squadron will now continue its missions with its successor, the MQ-9 Reaper. The Harfang has given way to the Reaper, which opens a new chapter in the history of drones, which are now the heirs of military recognition. Capable of flying twice as fast and twice as far, the Reaper drone offers range and accuracy far superior to that of the Harfang. "The 1/33 “Belfort” drone squadron and the Reaper still have beautiful pages to write and many challenges to overcome. Tomorrow, the French Reapers will be able, once armed, to better protect friendly troops on the ground, and to deal directly with moving targets. 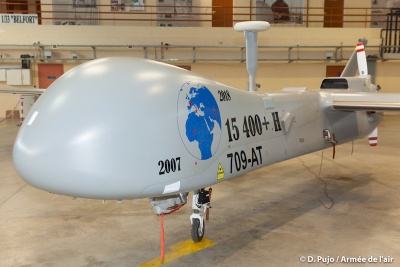 The withdrawal of the Harfang makes space for the arrival of the six additional Reaper Block 5 drones from 2019, and the 180 airmen of the drone squadron will become at least 320 by 2020," General Charpentier said at the end of his speech.